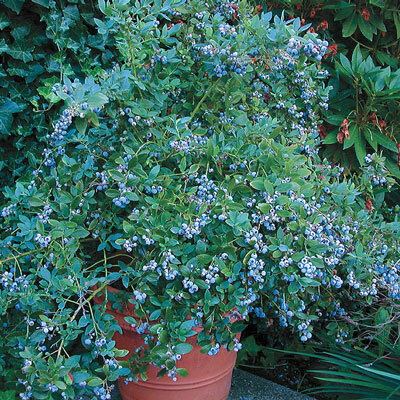 It has medium-sized, light blue berries with a wonderfully addicting, spritely flavor. Semi-dwarf matures at less than 3' tall, making it a perfect landscape plant. Tolerates a higher soil pH than most others. Showy, hot pink flowers fade to white and yield large crops. Evergreen foliage. Ripens late season. 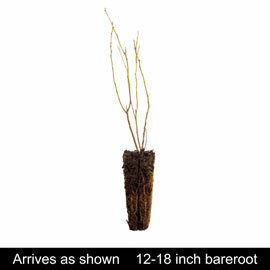 Bareroot. Zones 5–10. Foliage: Blue-green foliage, Fall foliage turns burgundy. Flower Form: Pink blossoms fading to white. Soil Requirements: Heavy and loose soils. Tolerates lower acidic soil than most blueberries. Pruning: Mature blueberry bushes should be pruned lightly, but not until they are three years old. Once they have reached three years, you should begin pruning early in the Spring every year. Just remove some of the oldest branches, and snip off any very weak looking twigs. Then you can trim all of the remaining stems by 1/3. Removing a third of the branches forces new growth, and new growth bears the most fruit. Fruit: Medium fruit size, sweet flavor, dark blue berries. Pollinator: Self pollinating, but will have better yields when planted with other blueberry varieties.